BP said Alligin and Vorlich are satellite fields located near to existing infrastructure meaning they can be quickly developed through established offshore hubs. BP also confirmed that it has awarded a major contract for the Alligin development to Subsea 7, which will provide project management, engineering, procurement and construction services for the subsea pipelines. Subsea 7 will deliver the contract from its Aberdeen base with offshore activities expected to get under way in 2019. 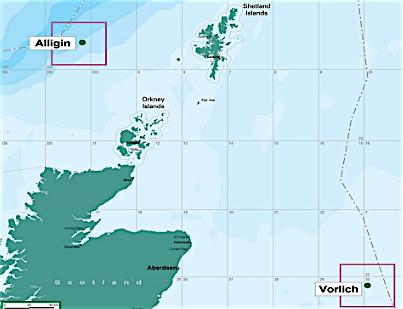 Alligin (BP 50% operator; Shell 50%) is a 20-million-barrel recoverable oil field in the Greater Schiehallion Area, located approximately 140 km west of Shetland. Vorlich (BP 66% operator; Ithaca Energy 34%) will recover over 30-million-barrels of oil equivalent and is located approximately 241 km east of Aberdeen.